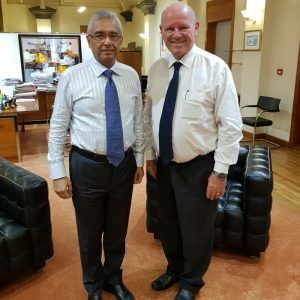 Port Louis (Mauritius) – May 28, 2018 (travelindex.com) – The Mauritius Prime Minister Hon Pravind Jugnauth yesterday the 24th of May welcomed Alain St.Ange, the Seychelles former Minister responsible for Tourism, Civil Aviation, Ports and Marine and now head of the Saint Ange Tourism Consultancy at his Port Louis City Centre Prime Ministers Offices. The Mauritius PM and Mr St.Ange had met briefly the day before at the official opening of the International Conference on Digitalisation and Sustainable Tourism that was taking place in Mauritius and agreed to meet more formally in Port Louis. The Prime Minister and Mr St.Ange had met in Seychelles a few years ago and was one invited to be on the VIP stage for the official opening of the first edition of the Carnaval International de Victoria in 2011. The Port Louis Meeting was the opportunity to discuss tourism and the Indian Ocean Vanilla Islands among other matters. Alain St.Ange said after the meeting that he was very happy with the discussions and thanked the Mauritius prime Minister Jugnauth for his welcome and friendship.